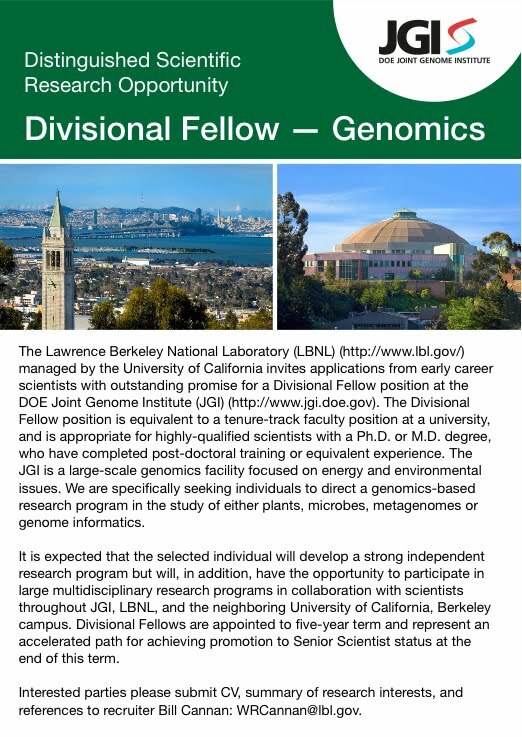 I would like to bring to you attention an elite early career faculty position presently available at the DOE Joint Genome Institute. The Divisional Fellow position that we are advertising (in Nature and Science, attached) is equivalent to a tenure-track faculty position at a university, and is appropriate for highly-qualified scientists with a Ph.D. or M.D. degree, who have completed post-doctoral training or equivalent experience. We are specifically seeking individuals to direct a genomics-based research program in the study of either plants, microbes, metagenomes or genome informatics. Divisional Fellows are appointed to five-year term, provided with research and salary support and an accelerated path for achieving promotion to Senior Scientist status at the end of this term. I urge you to contact me directly if you have questions about the position while interested parties should submit CV, summary of research interests, and references to recruiter Bill Cannan: WRCannan@lbl.gov. Author Jonathan EisenPosted on October 29, 2009 April 10, 2017 Categories Misc.Tags Genomics, Misc.